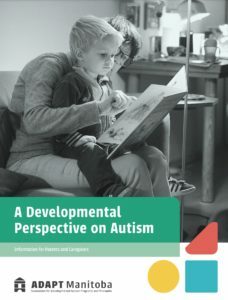 Last summer, two of us from ADAPT decided to see if we could create a way to share with parents what developmental therapies were all about. We were fortunate to receive a grant from Community Living Manitoba, and began to ask clinicians for their help writing a description of three therapies available in Manitoba: Relationship Development Intervention (RDI), DIR/Floortime, and Hanen’s More Than Words. Our goal was to create some materials to help parents understand what these therapies are about and what it looks like when you use them. We wanted to help parents find out what their options are and make decisions that are good for their child and family – decisions that ultimately lead to a good life for them and for their child. 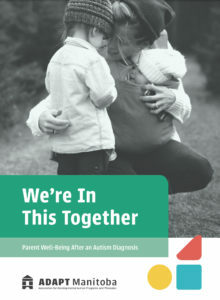 We now have a brochure for parents receiving a diagnosis for their child, a booklet explaining three therapies, and three videos! Development is not a straight line. But learning is a process of unfolding capabilities that often on what the child has already discovered. Speech therapists, for example, know a lot about how nonverbal social interaction comes before speech. Developmental therapists look at where a child is at, and suggest activities to fill in gaps that future learning depends on. This kind of learning pays attention to what is meaningful and enjoyable for each child. Lev Vygotsky was a developmental theorist and researcher who observed that children learn naturally when they are collaborating with more knowledgeable guides. With time and guidance practicing a new skill with others, children become competent and independent. How we do things is more important than what comes out of it, when we look at learning. It’s important that children learn to do and understand, but developmental therapies are more concerned that children have an active role in their own learning process – making choices, expressing interests and desires, and thinking. Most of all, we want them to learn how to learn. This means fostering curiosity, creativity, initiative, sharing ideas, collaboration, and welcoming the unexpected as opportunities to think again. Variety, creativity, uncertainty, and problem-solving opportunities occur naturally in everyday life, which gives us opportunities to gently push the child out of their comfort zone and stretch their thinking. Mistakes are okay! We want the trip to look like the destination. Rather than taking children aside and practicing skills one little piece at a time, we can model and practice in the places and situations where those skills are meaningful and purposeful. An intensive level of intervention is achieved because parents can make every interaction with their child an opportunity to learn. Developmental therapies look to build a sense of competence and satisfaction that comes as a natural result of learning. So systematically rewarding kids for success isn’t done. You’re doing what you would do with any child. All of these strategies are taken from the current understanding of child development, neurology, and the learning process. That means they apply to all children, but are adapted for children with autism so that we can compensate for their particular learning needs. It also means that if you use a developmental approach with children who are simply slower learners, there is no harm done – and probably a lot of good. Click on the image to see a PDF version of each document. Encouraging parents who have just received a diagnosis. Describing each developmental therapy available in Manitoba. These three videos were meant to explain what the therapies are meant to achieve, and what it is like for parents and children who use them as learning resources. Availablility. Access is often limited by geography, funded programming choices, or your budget. Start by looking at what you can access, and in what form the therapy is offered as available to you. Age. Hanen is meant for preschool children. DIR/Floortime and RDI are helpful for children of any age. Therapist. Find out the training level your potential therapist has achieved. Each of these three approaches has an organization and certification behind it, but anybody can SAY they are trained. Make sure you are working with someone who really is qualified. Also, choose someone who you and your child feels comfortable with! You’re going to spend some time talking about your family dynamics, which requires a level of comfort to be successful. Focus. Each of these therapies does have a different focus. Hanen is centred around developing communication. DIR/Floortime has a strong start in play and relationship building and works out from there. RDI is more likely to use everyday activities – even household chores – to build competence and communication. One of the three might feel better to you, depending on your background and preferences. MANY thanks to those who spent hours writing and editing, and to those who were willing to go on camera and share their knowledge and experience. Our sincere thanks to Community Living Manitoba for their support and contributions on this project, and for the work they do to support the inclusion, self-determination and empowerment of people with intellectual disabilities in Manitoba. This project was funded by the Government of Canada, Employment and Social Development Canada under the Social Development Projects for People with Disabilities program.